Do you ever add things to your cart online, to never buy them? I do this all the time! My Amazon cart has 40 (yes, 40) items in it that I have interest in buying but haven’t yet bought. The other day, I went to buy some wide tab dividers when I saw my educational books, among other things in my cart. I decided that each time I buy something on Amazon.com, I am also going to buy one of my educational books to help clear my cart and build my teacher library. The lucky winner this week (although Georgia Heard’s poetry books were a close runner up) was The Morning Meeting by Roxann Kriete. 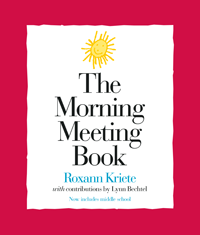 I had first heard about The Morning Meeting book when I was student teaching. I was introduced to the world of Responsive Classroom and this was a part of it. I always thought of the morning meeting as being a mainly elementary concept, so when I tore open my package today after work I was pretty excited to see “now includes middle school”. At the middle school level, I think there is a step away from Morning Meetings. Unfortunately, with that, at least I feel, there is loss of that sense of community that elementary grade classrooms often have. The school does have homeroom every morning but it serves more as a time to make announcements, sell tickets to dances, and collect any forms. 1. Greeting Students and teachers greet one other by name and practice offering hospitality. In a mentor setting, I think this is a valuable piece. This would be something that I would have them do during the first couple of meetings, spending about 5 minutes each time discussing different greetings. After the first two meetings, we would have a list of greetings to choose from and a different student for each meeting could “lead” the greeting. The tough part about mentors is that it only meets once every month which makes building a comfortable, trusting environment not impossible but there is definitely a cohesiveness missing that I wish we had. I think the greetings would help break the ice at the beginning of the year and it would break the ice each meeting. Since the groups rotate in a three year cycle (I have 8th graders this year and next year I would have 6th graders for a three year cycle), the greetings can be built upon each year. 2. Sharing Students share information about important events in their lives. Listeners often offer empathetic comments or ask clarifying questions. I think this is key in mentors (and in a regular morning meeting). As teachers and adults we often set our agenda for what needs to be talked about during the meeting, whether it is bullying or conflict resolution. This time allows the students to open up and share about their lives. I definitely expect students at first to be more reticent but hopefully over time they would feel more comfortable opening up. I recently read the book Period.8 by Chris Chrutcer in which what is said in the room stays in the room. The same rule would apply here. I know students would have a hard time feeling this is true though. I also think part of this time could be devoted to outlining expectations and having students create mentor rules for the year. Setting the guidelines and expectations from the get-go will allow the creation of a trusting community. 3. Group Activity Everyone participates in a brief, lively activity that fosters group cohesion and helps students practice social and academic skills (for example, reciting a poem, dancing, singing, or playing a game that reinforces social or academic skills). This is where the pre-set activity for the month would come in whether it was about heroes or digital footprint. The activities are often discussion and text based, with students reading an article and discussing it with peers, or completing a graphic organizer and then partner talking about how they filled it out. The last mentor group, the students met in small groups and prepared a skit on a specific attribute in relationships (such as trust, communication, or honesty), then presented the skit to the rest of the group. The observers then shared what parts of their skits demonstrated “good” relationship traits and which parts demonstrated “bad” relationship traits and why. I think this activity would actually be even better if done at the beginning of the year because it would help to illustrate expectations for the meeting times as well as lead to a larger discussion on what makes a healthy relationship. 4. Morning Message Students read and interact with a short message written by their teacher. The message is crafted to help students focus on the work they'll do in school that day. Instead of a morning message where students have to fix capitalization, or correct grammar errors, I think in a middle school mentor setting (where the focus is less on the academic), I would use a short quote related to the topic for students to read and debate; or just as food for thought at the end of the period, thinking about how the quote connects with what we had been working on and discussing during the mentor period. I also think incorporated to all these pieces are the opportunities for student leadership. A selected student can choose and lead the greeting each meeting, another can monitor sharing (perhaps choosing a theme or concept that sharing can relate to), another can be the time keeper during the activity and other can lead the discussion on the quote, perhaps giving their gut reaction the quote to start off the discussion and to get students comfortable sharing. I found online the overview of Morning Meetings that is actually taken right from the book itself. It provides a great preview of what the book is like and what Morning Meetings are.